Bordeaux can be quite intimidating especially in the often insane price tag. But the Left and Right Banks don’t need to be a part of what terrifies us about one of the most famous Old-World wine regions. They’re reasonably simple. We’ll start with what they are. You might have had no idea the Bordeaux region was divided into Left and Right banks, and that the banks refer to either side of the river on the Gironde Estuary. If you look at a map of southwestern France, you can see what looks like an upside-down “Y” slicing into Bordeaux territory. That is the Gironde Estuary, which is fed by two rivers called the Dordogne and the Garonne. 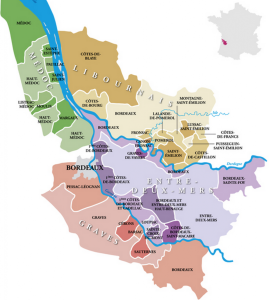 On the southwest side of the Gironde is the Left Bank, on the northeast side, the Right Bank, the two major areas where all Bordeaux wine is produced. Even though they’re part of the same winemaking region, the Left and Right banks of Bordeaux have significantly different terroirs, courtesy of the Gironde. On the left side the soil is rockier, packed with gravel and deep deposits of limestone. However bad soil doesn’t necessarily mean bad wine. In fact, the more the vine struggles for nutrients, the more character — and potential quality — it develops. Therefore Bordeaux wines of the Left Bank are considered prime candidates for aging, while Right Bank Bordeaux are generally thought to be smoother, drink-me-soon-style wines. The soil of the Right Bank is less “difficult” than that of the left Bank, with limestone closer to the top and less gravel to struggle through generally. The wines of the Right Bank don’t lack character. It’s just a different kind of character. Because of those differences in terroir, Left and Right Bank Bordeaux tend to showcase two different grapes: Left Bank wines are mostly Cabernet Sauvignon blended with Merlot; Right Bank wines are more Merlot, balanced with a smaller proportion of Cabernet. The Cabernet-driven Left Bank wines tend to be higher in tannin — again, making them good candidates for aging, which helps to mellow out the tannins and integrate the flavours of the wine. Merlot-driven Right Bank wines are generally smoother, with softer fruit flavours and balancing, but not dominating, tannins. What about the chateaux themselves? Those beautiful grand castle-looking buildings on Bordeaux labels? Well, they’re real, but again, different on the Left and Right Banks. On the Left Bank, Chateaux tend to look like little castles. Right Bank chateaux aren’t necessarily less grand, they just sit on smaller plots of land. Think 30 hectares, compared with 50 to 80 hectare vineyards on the Left Bank. In fact, the famous and incredibly expensive Right Bank wine Le Pin began as a one-hectare vineyard in 1979 but has since more than doubled in size to only 2.7 hectares. Big Left Bank players include names like Chateaux Margaux, Lafite, and Mouton Rothschild. Right Bank Bordeaux has fewer heavy hitters, there are wines such as Petrus, which is actually the most expensive wine in all of Bordeaux, and Cheval Blanc. It’s reasonably simple but a lot to remember. There is a short video you can watch on Facebook which explains a lot in just 45seconds.